When you find yourself spending more time searching for your makeup rather than applying it, it may be time to consider some serious de-cluttering and organizing. Tossing out the old, and figuring out which products you use most often, is the most difficult part. But once you’re over that hump, the fun part is organizing all your favorites and everyday essentials on your vanity with modern (not to mention conveniently see-through) acrylic makeup organizers. Here are 6 gorgeous and affordable options to help you get started! 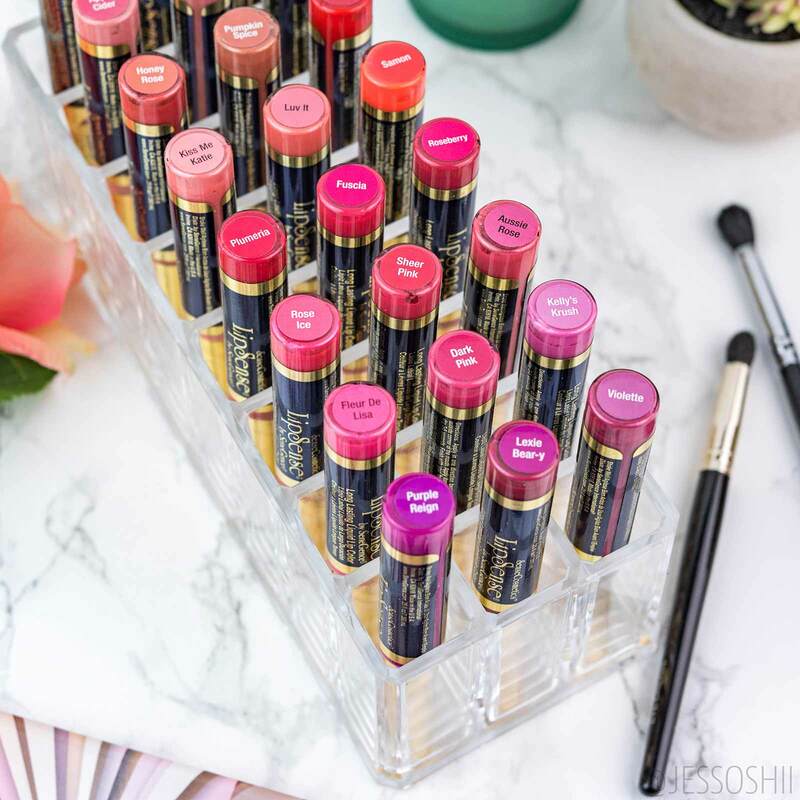 This is one of my favorite acrylic organizers for storing liquid lipsticks or glosses (and especially if you want to be able to see the shade label on the bottom for say, your Lipsense lipsticks, like I have shown above). It is extremely sturdy and well-made, and turns my lipsticks into a pretty little display on my vanity. The organizer holds 24 lipsticks, and comes in clear, black, and purple. Available on Amazon US and UK. If you buy your lipsticks mainly in tubes (or have both kinds of lipsticks that you need to store – I mean, who doesn’t?! ), the byAlegory Acrylic Lipstick Organizer offers 24 spaces that allow you to store your lipsticks in an upright position, providing quick and easy access. Palettes are a heck of a lot easier to find when they’re neatly ‘shelved’ rather than piled on top of one another in a drawer. This acrylic organizer helps to solve that problem. It’s extremely versatile in that you can stand it up on your vanity and stack eyeshadow palettes, or lay it down on a table top horizontally to store wider palettes. It comes with 8 separate slots, plus the dividers are removable, which allows you to adjust the size of the slots. A third favorite of mine from byAlegory is their eye/lip pencil holder. A simple cup or candle holder works fine for holding makeup pencils, but this little guy makes finding the exact shade you’re looking for a little bit easier than shuffling through a mug (and I don’t know about you, but I tend to really cram them in there – picking up pencils one-by-one just to find what I’m looking for). This acrylic organizer holds 26 pencils, including 20 regular sided and 6 jumbo sized. Storing makeup brushes has always been a frustration for me. While I love the easy access of an open plant pot/mug/candle holder, something about leaving all my brushes out in the open to collect dust and whatever else may be floating in the air really unsettles me. Thankfully, Lifewit created a little solution to this problem, by encasing a brush holder in an acrylic organizer case. What’s even cooler is that it also comes with little drawers that are the perfect size for storing beauty blenders and sponges, so you can keep all your tools in one central spot! This is another one of my personal favorite makeup organizers. I bought it a few years back when it was $90, and now it’s down to around $55 (a steal in my opinion – heck, I’m tempted to buy another one!) 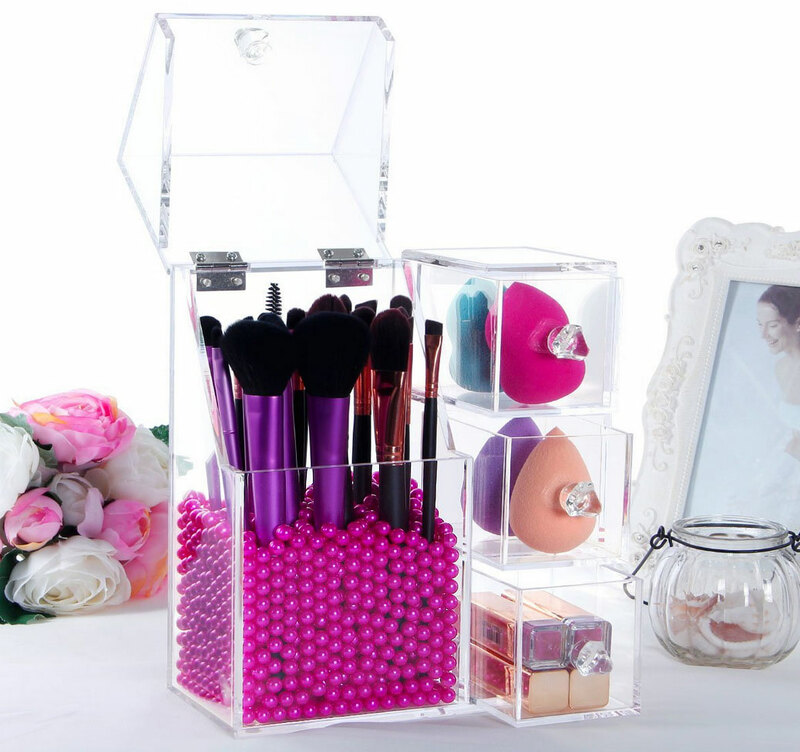 It’s made of gorgeous, clear acrylic that’s thick and sturdy, and perfect for storing anything from makeup, skincare, bath goodies, or even jewelry. It features four drawers (three 2″ deep drawers, and one 3″ deep drawer), along with a 3″ deep top compartment, complete with a top lid that you can keep either closed or fold all the way down against the back of the organizer. Whitmor also has some acrylic dividers that you can pick up for ~$10 to help organize the drawers (including a 6-section and an X divider). What are some of your favorite storage solutions for keeping your vanity organized?